It’s here! 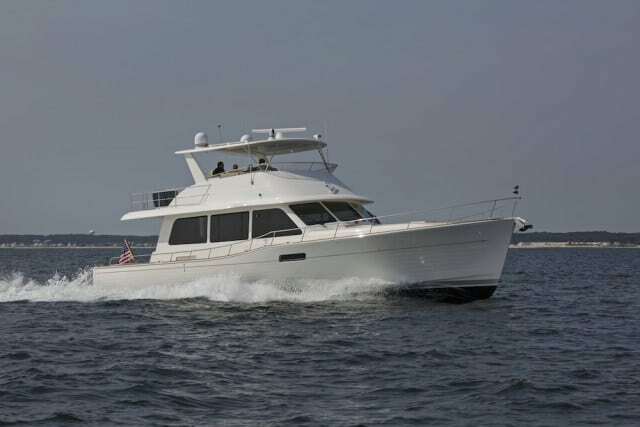 Grand Banks introduces the highly anticipated Grand Banks 60 at the Newport International Boat Show. To celebrate the 60th anniversary of Grand Banks, this anticipated yacht furthers the company’s reputation of designing, engineering and building high-tech, long-range motor yachts that have satisfied cruising owners since the 1960s. 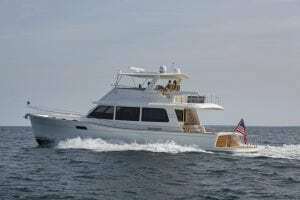 The new Grand Banks 60 incorporates the latest marine technologies, from leading-edge construction to well-proven and reliable propulsion and maneuvering systems. Following Hull No. 1’s successful debut at the Sanctuary Cove International Boat Show in May, Hull No. 3 is displayed at the Newport International Boat Show, September 14 to 17. To make the yacht strong, light and more efficient, the entire deck and cabin house are fully infused using the highest quality carbon fiber available —a method primarily seen on performance sailing craft. A fully-cored structure is employed using PVC foam core in areas of specific application, sandwiched between skins of stitched multi-axial carbon fiber, bonded with vinylester and epoxy resins and supported by infused composite panels in a robust grid system — all working together for long life, strength, and reliability in punishing open water conditions. The GB 60 measures 65’4” overall, has a beam of 19’2”, and draws less than four-feet if equipped with the IPS pods. 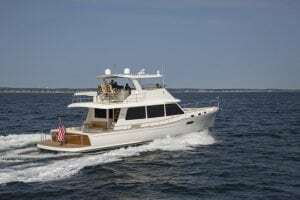 This means that Grand Banks is delivering a large, comfortable yacht that can be owned and operated by a knowledgeable cruising couple, with the interior volume that makes extended stays practical for owners and their guests, and the capability to explore waters less frequented by other 60-footers with deeper draft. And the company is delivering these themes in a design that hearkens back to the days when balance and proportion were prerequisites for a desirable yacht, one that would be visually pleasing over decades. A quick glance at the exterior also sets this design apart as a true ocean-going yacht, with a large and well-protected flybridge, wide side decks with high bulwarks and handholds, and an extended boat deck that shelters the aft deck from the elements. All of this, coupled with the optional Sea Keeper stabilizer, positions the new GB 60 in the front of the pack in both safety and comfort. Seating abounds on the spacious flybridge, on the aft deck, and in the generous salon. Large electric windows bathe the main cabin — salon, lower helm, and aft galley are all located on one level deck — with an abundance of natural light and ventilation, perfect for family and friends to relax while underway offshore or on the hook. With three generous staterooms and two full-size heads, finished in Grand Banks’ hallmark handcraftsmanship, guests will enjoy the overnight accommodations usually reserved for owners. The owner’s stateroom is located in the midships, featuring a spacious walk-in wardrobe and full-height mirrors.